Aim: This study aimed to evaluate the cleaning protocol of dentin impregnated with epoxy resin-based sealer (AH Plus) and the effects on the adhesive interface using 95% ethanol (E) or formamide solution (F) associated with microabrasion with glass microparticles (M). Methodology: Forty dentin specimens were impregnated with sealer (AH Plus). Specimens were cleansed according to the following protocols (n = 10): G1 (E); G2 (F); G3 (E = M); and G4 (F = M). No treatment was performed in G5 (control). Specimens were subjected to standard error of the mean to evaluate the residues persistence (×500) and open dentinal tubules counting (×2000). Another fifty specimens were subjected to similar procedures and cleaning protocols. Seven days later, composite-resin-made specimens were performed on dentin using etch-and-rinse adhesive system, then submitted to microshear test. Results: G2 and G4 showed higher residues' persistence and lower incidence of open dentinal tubules than G1 and G3 (P < 0.05). No difference was found between G1 and G3 or G2 and G4 (P > 0.05). Adhesive system bond strength was similar in all groups (P > 0.05). Conclusions: Microabrasion negatively affected the epoxy resin-based sealer residues' removal protocols' action; all groups presented residues on the dentin surface. However, 7 days later, the protocols did not affect the bond strength of adhesive system to sealer-impregnated dentin. Ethanol is the most commonly used substance in cleaning protocol of dentin impregnated with endodontic sealer., It is used alone or associated with diamond bur debridement in the cleansing treatment of dentin surface impregnated with zinc oxide-eugenol-based sealer (Endomethasone), reverting the bond strength of self-etching adhesive system to dentin. On the other hand, ethanol is ineffective in cleansing dentin with epoxy-based sealer residue. Formamide solution (Endosolv R) is another alternative since it presents a satisfactory action on epoxy resin-based sealers. In addition, it is also recommended in root canals obturated with AH Sealer retreatment., This solution prevents the bond strength reduction of self-etching adhesive systems (Clearfil SE Bond e Clearfil Tri-S Bond) after cleaning protocol is carried out in AH Plus impregnated dentin. However, the effects are still unclear when etch-and-rinse adhesive system is used instead of self-etching adhesive system. Since the cleaning solutions do not provide the complete removal of endodontic sealer residues,,,,, their association with mechanical and/or abrasive methods can be an appropriate alternative. Recently, microabrasion with glass microparticles associated with 2% chlorhexidine gel (Concepsis Scrub) has been recommended on temporary cement residues' removal in dentin surface; moreover, it showed to reverse the bond strength of resin cement to dentin. However, there have been no studies evaluating the cleaning protocol in dentin impregnated with endodontic sealer. Thus, the aim of this study was to evaluate the efficiency of 95% ethanol (Rinse-N-Dry; Vista Dental, Racine, WI, USA) and formamide solution (Endosolv R; Saint-Maur-des-fossés Cedex, FR), with microabrasion using an antimicrobial gel containing glass microparticles (Concepsis Scrub; Ultradent, South Jordan, UT, USA) and their effects on the bond strength of etch-and-rinse adhesive system to dentin previously impregnated with an epoxy resin-based sealer (AH Plus; Dentsply De Trey, Konstanz, GE) and submitted to several residues removal protocols. The null hypothesis is that cleaning protocols do not completely remove the sealer residues and affect the bond strength of adhesive system to impregnated dentin. G5 (control): No cleaning treatment was performed. Fifty dentin specimens (5 mm × 5 mm × 3 mm) were obtained from the middle third of bovine incisors crown, using a hard tissue-cutting machine (Isomet; Buehler, Lake Bluff, IL, USA) under water cooling. Afterward, they were individually immersed in 5 mL of 2.5% NaOCl (Asfer, São Caetano do Sul, SP, BR), for 15 min, and then in 5 mL of 17% EDTA (Biodinamica, Ibiporã, PR, Brazil) for 3 min. In sequence, 5 mL of 2.5% NaOCl was used as a final irrigation solution. Finally, all specimens were dried using absorbent paper, according to methodology reported in Jordão-Basso et al. Ten specimens were kept untouchable and used as control group (G %5). For the other forty specimens, an epoxy resin-based sealer (AH Plus; Dentsply De Trey, Konstanz, Germany) was handled, in a 1:1 proportion, according to the manufacturer's instructions. The endodontic sealer was then spread over pulp chamber dentinal surface using a microbrush (FGM, Joinville, SC, Brazil) and left untouched for 15 min. Then, these specimens were randomly divided into four experimental groups (n = 10), according to endodontic sealer residues cleaning protocol, as previously described in groups evaluated session. In experimental groups, epoxy resin-based sealer was removed using a cotton pellet embedded in 95% ethanol (G1 and G2) or formamide (G3 and G4) and rubbed onto pulp chamber dentinal surface until the sealer had been visually removed. However, in G2 and G4, dentinal surface was also submitted to microabrasion using a prophy cup and 2% chlorhexidine gel-containing glass microparticles (Concepsis Scrub; Ultradent, South Jordan, UT, USA) for 15 s. In sequence, theses specimens were washed, for 1 min, with distilled water. The specimens were dehydrated inside a sealed chamber containing silica gel for 24 h. All specimens were mounted onto metal stubs, gold-sputter coated (single cycle-120 s) under vacuum inside a metalizing chamber (MED 010, Balzers Union, Balzers, Liechtenstein), and examined using scanning electron microscopy (JEOL 6060; JEOL Ltda, Tokyo, Japan), operating at 15 kV. Four different fields were evaluated in each specimen, and an image representative of the specimen was obtained at × 500 and × 1000 magnification. Two independent and proper calibrated examiners evaluated the residues persistence on dentin surface, using microimages at × 500, according to Kuga et al. Parameters: Score 1, absence or discrete residues presence with visible open dentinal tubules; Score 2, discrete residues presence, with more than 50% residue-free dentin surface; Score 3, moderate residues presence, with < 50% residue-free dentin surface; and Score 4, intense residues presence, with dentinal tubules opening practically or totally obstructed. 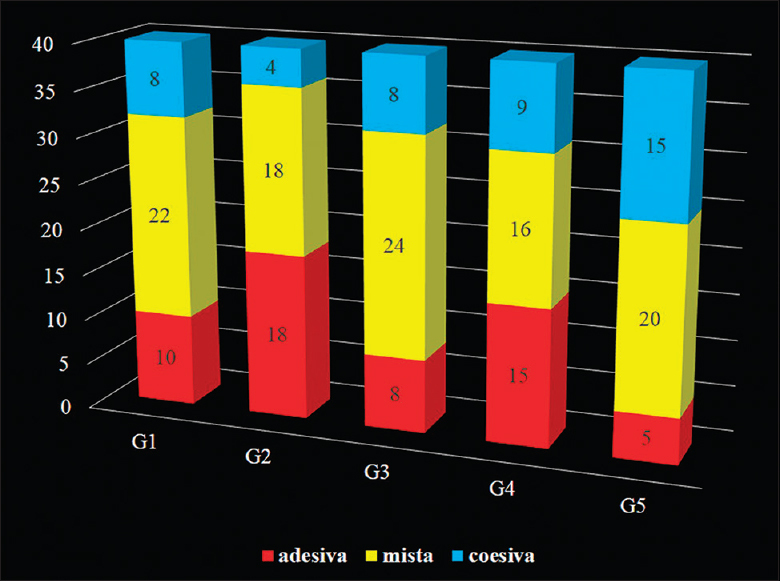 The open dentinal tubules counting without residues presence was obtained using the Photoshop CS5 program (Adobe Systems, San Jose, California, USA), as described by Jordão-Basso et al. Fifty specimens (10 mm length × 5 mm width) were obtained from the bovine incisor crowns. The buccal surface fragment was flattened with a polishing machine (DP-10; Panambra, Struers, Ballerup, DEN) using #320 and #600 silicon sandpapers, for 20 s, to exposure and planning dentinal surface. Then, the fragments were placed into a polystyrene matrix mold (16.5 mm width × 25.0 mm length) and embedded with acrylic resin (Classic Jet, São Paulo, SP, BR) left undisturbed for 1 h.
Forty specimens were impregnated with endodontic sealer (AH Plus), subjected to several cleaning protocols, as described in endodontic sealer residues persistence evaluation study. Therefore, specimens were divided into four experimental groups (n = 10) and one control group (G5). The specimens were stored at 37°C, in a humidity-free environment, to final set epoxy resin based. After 7 days, dentin surface was submitted to acid etching using 37% phosphoric acid, for 15 s, washed with distilled water for 30 s, and drying with absorbent paper, keeping dentin slightly moistened. In sequence, an etch-and-rinse adhesive system (Scothbond Multi-Purpose; 3M ESPE, St. Paul, MN, USA) was applied on dentin surface, and light cured using a LED-laser system (Bluephase; Ivoclar Vivadent, Schaan, Liechtenstein, AL), with 1.200 mW/cm2 light intensity for 20 s. In sequence, four cylinders (0.7 mm internal diameter × 1.0 mm height) made of composite resin (Filtek Z-250; 3M, St. Paul, MN, USA) specimens were bonded on the buccal surface, two at mesial and two at distal. Afterward, the specimens were stored in a 100% relative humidity environment at 37°C, and the microshear bond test was performed after 24 h. All specimens were fixed inside a metal matrix, so the composite cylinders specimens were placed perpendicularly to a 500 N load cell. An orthodontic wire (0.2 mm diameter) held the composite cylinder base, and all specimens were subjected to compressive loading with 0.5 mm/min crosshead speed with EMIC DL2000 electromechanical testing machine (EMIC, São José dos Pinhais, PR, Brazil) until obtaining composite specimens displacement. Bond strength was obtained from maximum force (N) divided by union area (mm2) in MPa. Arithmetic average was calculated for the four composite specimens from each fragment and called mean specimen. The failure mode was analyzed in stereomicroscope (×20) and classified as: (1) adhesive, between dentin and adhesive system; (2) cohesive, in the adhesive system; and (3) mixed, partial between dentin and adhesive system. Residues' persistence data were subjected to Kruskal–Wallis and Dunn tests. Open dentinal tubules counting and bond strength of adhesive system data were submitted to ANOVA at one criterion and Tukey tests. All evaluations were performed at 5% significance level. Regarding the residues persistence on dentin surface, G1 and G3 presented lower incidence than G2 and G4 (P < 0.05). No difference was found between G1 and G3 or G2 and G4 (P > 0.05). G5 presented no residues. In relation to open dentinal tubules, G1 and G3 presented a higher number than G2 and G4 (P < 0.05). No difference was observed in the amount between G1 and G3 or G2 and G4 (P > 0.05). G5 showed the highest number of open dentinal tubules. [Figure 1] shows residues' presence and open dentinal tubules incidence in all groups. Seven days later, cleaning protocols did not affect the bond strength of etch-and-rinse adhesive system to dentin impregnated with epoxy resin-based sealer (P > 0.05). [Table 1] shows the median, maximum, and minimum score values attributed to endodontic sealer residues persistence in microscopic images and the arithmetic mean and standard deviation of open dentinal tubules (units) amount and bond strength of adhesive system to dentin (MPa), according to the evaluated groups. [Figure 2] displays the failure mode incidence according to the groups. Mixed failure was the most observed one among the groups. No cleaning protocol completely removed the epoxy resin-based sealer (AH Plus) resides from dentin surface and immediate abrasion with glass microparticles in 2% chlorhexidine gel presented higher residues dispersion causing a higher dentinal tubule opening obstruction. However, after 7 days, these cleaning protocols no affected the bond strength of etch-and-rinse adhesive system in dentin. Thus, the null hypothesis was rejected. “Like dissolves like” concept means a polar solute dissolves in polar solvents. However, 95% ethanol cleaning protocol showed endodontic sealer residues persistence on the dentin surface in all situations. Although epoxy resin is a nonpolar substance and ethanol is a polar solvent, but presenting both polar and nonpolar characteristics, the residues' persistence may have occurred due to water presence in 95% ethanol solution (Rinse-N-Dry) used in our study, since its pharmaceutical formula is extremely volatile. As epoxy resin-based sealer is insoluble in water, possibly its residues remained scattered over the dentinal surface in G1 and G2, in agreement to Kuga et al. Although formamide is a nonpolar solvent, in our study, its cleaning potential was similar to 95% ethanol. Jordão-Basso et al. observed that, when used before final setting sealer, xylol has similar epoxy resin-based impregnated dentin surface cleaning potential to ethanol. On the other hand, we believe that the results obtained are due to the similar cleaning potential and chemical properties between formamide and xylol and consequently to 95% ethanol. In our study, when the microabrasion with prophy cup and 2% chlorhexidine gel-containing glass microparticles gel was performed, the endodontic sealer residues presented in a fluid consistency. As epoxy resin is hydrophobic, this cleaning protocol caused sealer residues dispersion, and consequently lower open dentinal tubules incidence, as observed in [Figure 1]. Despite Roberts et al. observed that only formamide (Endosolv R) reversed the bond strength of two-step self-etching (Clearfil SE Bond) or one-step self-etching (Clearfil Tri-S Bond) adhesives after cleansing dentin previously impregnated with sealer (AH Plus), in our study, we observed that 95% ethanol also was efficient to reverse the bond strength, but when used etch-and-rinse dentin adhesive system. Adhesion between dentin and etch-and-rinse dentin adhesive system occurs mainly by mechanical action, through the hybrid layer formation. This adhesive system is considered as reference and gold standard to compare with other systems., As self-etching adhesive system has a chemical bond with hydroxyapatite, any residues can interfere negatively on this chemical reaction and consequently on adhesive interface. Therefore, in our study, the bond strength was not affected possibly due to dentin acid etching and adhesive strategy used. Furthermore, these adhesives present higher mechanical bonding with dentinal substrate and lower adhesive interface degradation by hydrolysis,, due to hydrophobic resin presence in the primer chemical composition,,, which minimized differences among dentin cleaning protocols. Future studies should be carried out to find the best endodontic residues sealer removal protocols, favoring the longevity of esthetic restorations and endodontic treatment. 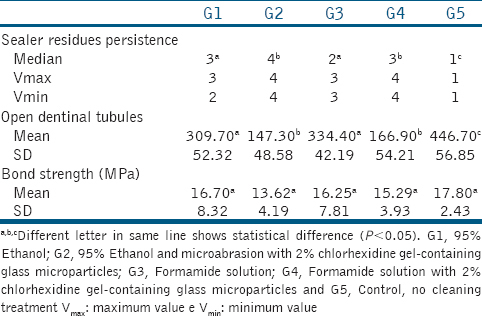 Immediate microabrasion, using 2% chlorhexidine with glass microparticles, had a negative effect on epoxy resin-based sealer residues' removal protocols' action, when used 95% ethanol or formamide. However, 7 days later, the treatments did not affect the bond strength of etch-and-rinse dentin adhesive system to dentin. Plotino G, Buono L, Grande NM, Pameijer CH, Somma F. Nonvital tooth bleaching: A review of the literature and clinical procedures. J Endod 2008;34:394-407. Kohli MR, Yamaguchi M, Setzer FC, Karabucak B. Spectrophotometric analysis of coronal tooth discoloration induced by various bioceramic cements and other endodontic materials. J Endod 2015;41:1862-6. Kuga MC, Só MV, De Faria-júnior NB, Keine KC, Faria G, Fabricio S, et al. Persistence of resinous cement residues in dentin treated with different chemical removal protocols. Microsc Res Tech 2012;75:982-5. Kuga MC, Só MV, De Campos EA, Faria G, Keine KC, Dantas AA, et al. Persistence of endodontic methacrylate-based cement residues on dentin adhesive surface treated with different chemical removal protocols. Microsc Res Tech 2012;75:1432-6. Jordão-Basso KC, Kuga MC, Bandéca MC, Duarte MA, Guiotti FA. Effect of the time-point of acid etching on the persistence of sealer residues after using different dental cleaning protocols. Braz Oral Res 2016;30:e133. Bronzato JD, Cecchin D, Miyagaki DC, de Almeida JF, Ferraz CC. 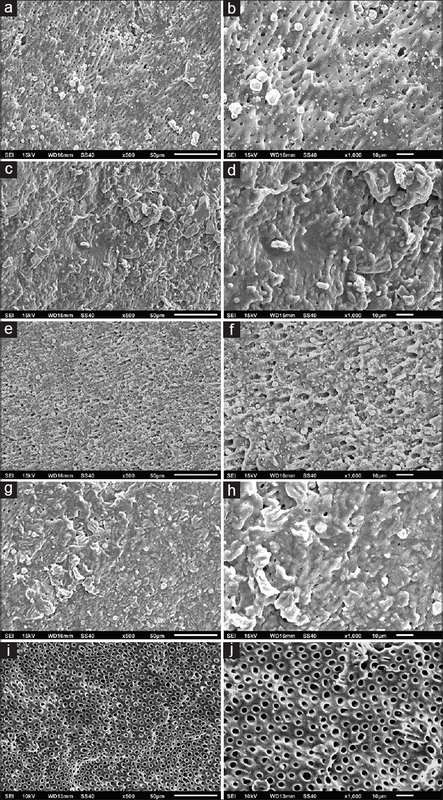 Effect of cleaning methods on bond strength of self-etching adhesive to dentin. J Conserv Dent 2016;19:26-30. Aranda-Garcia AJ, Kuga MC, Vázquez-Garcia FA, Tonetto MR, Bandeca MC, Lima SN, et al. Persistence of residues after endodontic retreatment related to the obturation technique and to the solvent. World J Dent 2017;8:41-4. Saraç D, Bulucu B, Saraç YS, Kulunk S. The effect of dentin-cleaning agents on resin cement bond strength to dentin. J Am Dent Assoc 2008;139:751-8. Victorino KR, Kuga MC, Duarte MA, Cavenago BC, Só MV, Pereira JR. The effects of chlorhexidine and ethanol on push-out bond strength of fiber posts. J Conserv Dent 2016;19:96-100. Chávez-Andrade GM, Kuga MC, Duarte MA, Leonardo Rde T, Keine KC, Sant'Anna-Junior A, et al. Evaluation of the physicochemical properties and push-out bond strength of MTA-based root canal cement. J Contemp Dent Pract 2013;14:1094-9. Kuga MC, Faria G, Só MV, Keine KC, Santos AD, Duarte MA, et al. The impact of the addition of iodoform on the physicochemical properties of an epoxy-based endodontic sealer. J Appl Oral Sci 2014;22:125-30. Dainezi VB, Iwamoto AS, Martin AA, Soares LE, Hosoya Y, Pascon FM, et al. Molecular and morphological surface analysis: Effect of filling pastes and cleaning agents on root dentin. J Appl Oral Sci 2017;25:101-11. Do Prado M, Simão RA, Gomes BP. Evaluation of different irrigation protocols concerning the formation of chemical smear layer. Microsc Res Tech 2013;76:196-200. Gwinnett AJ. Quantitative contribution of resin infiltration/hybridization to dentin bonding. Am J Dent 1993;6:7-9. Gwinnett AJ. Altered tissue contribution to interfacial bond strength with acid conditioned dentin. Am J Dent 1994;7:243-6. Lorenzoni E Silva F, Pamato S, Kuga MC, Só MV, Pereira JR. Bond strength of adhesive resin cement with different adhesive systems. J Clin Exp Dent 2017;9:e96-e100. Souza IM, Araújo CS, Soares CJ, Faria-E-Silva AL. Effect of dentin pretreatment on bond strength stability of self-etching and etch-and-rinse adhesives to intracoronally bleached dentin. J Adhes Dent 2016;18:349-54. Van Meerbeek B, Inokoshi S, Braem M, Lambrechts P, Vanherle G. Morphological aspects of the resin-dentin interdiffusion zone with different dentin adhesive systems. J Dent Res 1992;71:1530-40. Armstrong SR, Vargas MA, Fang Q, Laffoon JE. Microtensile bond strength of a total-etch 3-step, total-etch 2-step, self-etch 2-step, and a self-etch 1-step dentin bonding system through 15-month water storage. J Adhes Dent 2003;5:47-56. Nawareg MM, Zidan AZ, Zhou J, Chiba A, Tagami J, Pashley DH, et al. Adhesive sealing of dentin surfaces in vitro: A review. Am J Dent 2015;28:321-32. De Munck J, Van Landuyt K, Peumans M, Poitevin A, Lambrechts P, Braem M, et al. A critical review of the durability of adhesion to tooth tissue: Methods and results. J Dent Res 2005;84:118-32. Yaguchi T. Layering mechanism of MDP-ca salt produced in demineralization of enamel and dentin apatite. Dent Mater 2017;33:23-32.